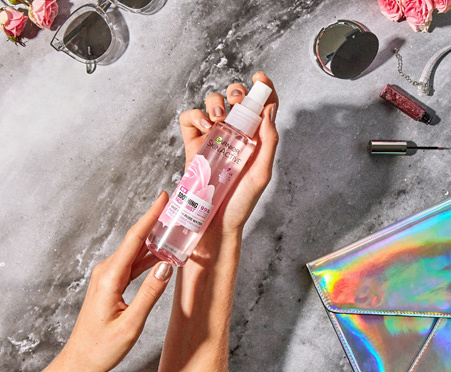 Made with Rose Water, this soothing facial mist instantly hydrates and refreshes skin, even after makeup. It can be used as a moisturizer to hydrate, before makeup as a primer, after makeup to set it, and anytime throughout the day to refresh skin. The ultra-fine droplets absorb quickly into skin and won’t disturb your makeup. It’s 99% naturally-derived and formulated without parabens, dyes and silicones. Suitable for sensitive and normal skin. I am always hesitant to use new products becasue I have very sensitive skin, but Garnier SkinActive Soothing Facial Mist with Rose Water did not let me down. This product is a great pick me up to freshen up my skin during the day! I absolutely LOVE LOVE LOVE the smell of the Garnier SkinActive Soothing Facial Mist with Rose Water. It has such a sweet feminine smell to it. I really like to use this product first thing in the morning. It has an invigorating property to it. Truth be told, I have extremely sensitive skin, even hypoallergenic products have been known to break me out. Suprisingly this product doesn't. I received a product sample, via PinchMe, of Garnier SkinActive Soothing Facial mist. I have had it about a week now and have used it multiple times throughout the day. For the record, I have been using a different company's rose hydrosol facial spray as well as a rose water and witch hazel based spray toner (also from a different brand), I had expectations for this product to be similiar to either one of those. My sample arrived and I was, at first, impressed by the bottle size and look. I like the fact that it is a vegan formula and I hope Garnier continues to move forward on becoming vegan as well as cruelty free. As far as the product goes, I am torn. The sprayer works well, as long as you follow the directions about how far away to hold the bottle. If you hold it too close to your face, you will end up with a thick coating of product. Which brings me to my only gripe...this product leave a sticky layer on my face once it has dried completely. Since I've had the product a week, I have figured out that a little bit goes a very long way. I find that it can be refreshing at first and the scent is ...ok. It doesn't smell like true roses but it is very pretty. I have very sensitive skin..like, VERY sensitive. Even plain water causes me to suffer an awful burning rash sometimes. I have to say, this product has not caused any type of rash. I do notice that my pores will clog a bit if I get too thick of a layer on my face but that was before I learned the correct distance from which to spray. I like to use this product after washing my face and using my old spray on toner. It moisturizes just enough so that I don't have to apply lotion (which aggravates my rash so I have been using pure vitamin e oil in place of lotion but just like Garnier's rose spray, it leaves a coating. My oil leaves a light coating, though.. Garnier leaves almost a sticky and tacky feeling, which, I find to be neither soothing nor refreshing) I will continue to use this product until ive finished the bottle before I make a decision as to whether or not I would purchase it. I want to love it but I'm struggling to get past that tacky feeling. I received the Garnier SkinActive Soothing Facial Mist with Rose Water for free from PINCHme. I was happy to find out that I was going to be testing out this product. Why? Because I am always on the hunt for a hydrating facial mist that also keeps your skin refreshed and has rose water. Plus, I also used the Mario Badescu Facial spray and I was really interested in finding out if they are similar or very different products. I definitely like that this product is also a setting spray aside from a moisturizer. So, that was definitely a plus! The best thing about this as well as the nozzle was not as harsh and was so easy to spray an even layer all over my face prior to applying makeup and also after to add an extra spritz. I definitely felt refreshed and hydrated through out the day. After a week of using the Garnier SkinActive Soothing Facial Mist with Rose Water, I noticed that this spray lasted longer in keeping my skin moisturized as well as made my skin look extra glowy. I went out and purchased another bottle for backup and will continue to use this over the Mario Badescu spray. You can't beat the cost and the amount of product you are receiving. Highly recommend. I was not sure what to expect when I first tried Gardiner SkinActive Soothing Facial Mist with Rose Water. I am not a big fan of being "splashed" in the pool or getting water into my eyes, so I didn't know how I would feel about this facial mist. After I tried it, I realized that I was a bit of a baby and also that I really love this facial mist! The smell is divine and my skin looked amazing! This product is great on a work day, when you cannot necessarily go to the restroom to wash off your face but you need to feel refreshed. This would be a great gift to loved one, but be sure to purchase a bottle for yourself! p.s. I received a bottle as free sample from PINCHme in exchange for an unbiased review. I hope this helps you make a decision! Both my boyfriend and I have super sensitive skin, and when I received this, we both sprayed and waited for the burning that usually comes with anything for our faces. This product did not irritate our skin, and instead made it feel refreshed and soft. It smells good as well, and just makes for a pleasant experience when using it. It made a few spots a little dry on my face. Overall it was nice abd refreshing. I mist first thing in the morning to wake up my skin. I also found it nice on rough patches i have from scarring and eczema on my upper arms. I absolutely love the Gabriel SkinActive Soothing Facial Mist with Rose Water! It feels so refreshing to spray on my face when I need a little boost! I always use it also as a setting spray! Definitely a must buy! The Garnier SkinActive Soothing Facial Mist with Rose Water is great. It smells really nice and leaves you feeling refreshed. I am so in love with the Garnier SkinActive Soothing Facial Mist with Rose Water!! I use it multiple times throughout the day and it makes my skin feel amazing! I use many different skin care items and within one use this instantly became my favorite. It’s very refreshing and soothing, and it’s the easiest product to give your skin a boost any time of day. I’ve used it over makeup and it still worked wonders without messing anything up. I usually don’t rave over products this much but I definitely recommend this stuff. I received the Garner SkinActive: Soothing Facial Mist with Rose Water FREE from PINCHME.com. Now, let’s be honest anyone who knows me knows that if I ever review a product I’ve paid for I’m brutally honest and the same is for the ones I receive for FREE. I can’t help but be so ecstatic that they used a vegan formula, but still question their animal testing methods. The formula is very soothing as the product states it would be. The rose water fragrance is very potent which I love, and the mist is exactly that a mist. I had to spray my face several times because this product is so light weight I couldn’t tell if the product was getting on my face. Overall, I will say that this product is worth trying. I have extreme dry skin and when I say that my skin was hydrated after using this even in the winter time when I’m most dry I definitely recommend this product. Nothing particularly special but the brand itself, the fact it doesn't spray but like a tiny squirt makes it hard to not have to uncap it to use. the Garnier SkinActin Soothing Facial Mist with Rose Water is a good product. I am not a fan of the fragrance, but it is mild and I have not felt any irritation. I like the soothing properties and it refreshes my face throughout the day. I have even used it as setting spray to melt my makeup together. I received this product through Pinchme but the opinions are my own. Great product. 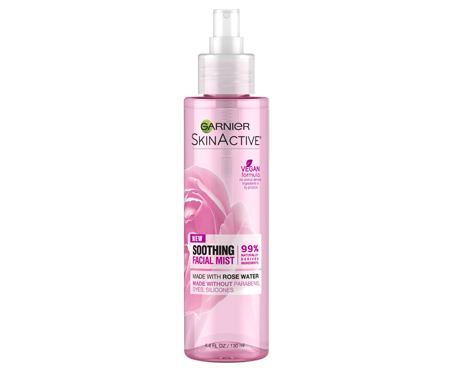 Garnier SkinActive Soothing Facial Mist with Rose Water is very refreshing and doesn’t leave your skin with build up. I would recommend it for all times of day. I recieved Garnier SkinActive Soothing Facial Mist with Rose Water. I love that the facial mist has a vegan formula. I really love that the product is 99% naturally derived and has no parabens, dyes, or silicones. The facial mist feels refreshing and has a wonderful scent. Amazing Facial mist when needed a bit of hydration for the face with and without makeup. Rosewater is also amazing for acne so it helps keep the acne low and make it disappear and since it is chemically and vegan free it is a huge plus. I receive "Garnier Skin Active Soothing Facial Mist with Rose Water" to try out. I was heisted to try "Garnier Skin Active Soothing Facial Mist with Rose Water" because I wasn't sure how well this facial mist will fit well with my routine. Turns out i"Garnier Skin Active Soothing Facial Mist with Rose Water" is the best facial mist to use. "Garnier Skin Active Soothing Facial Mist with Rose Water" does not ruin my makeup, which is a plus. The smell of rose water is amazing. I can see myself buying "Garnier Skin Active Soothing Facial Mist with Rose Water" in the near future. Finally, I would highly recommend this product to anyone. I received a free sample of Garner SkinActive Soothing Facial Mist with RoseWater from PINCHme and I love it! It smells and feels lovely on my skin! A great way to quickly refresh your face and your senses with the light, uplifting fragrance! I was so excited when I received my free sample of GARNIER SKINACTIVE SOOTHING FACIAL MIST WITH ROSE WATER, I couldn't wait to use it. Not only does it make my skin feel amazing, it doesn't irritate my sensitive skin plus it smells amazing!!! The brand garner skinactive and their product soothing facial mist with rose water is doing such wonders on my skin !